The Blitz Musketeer RDA is an easily-operated RDA and it comes with 24mm diameter. 2 colors. 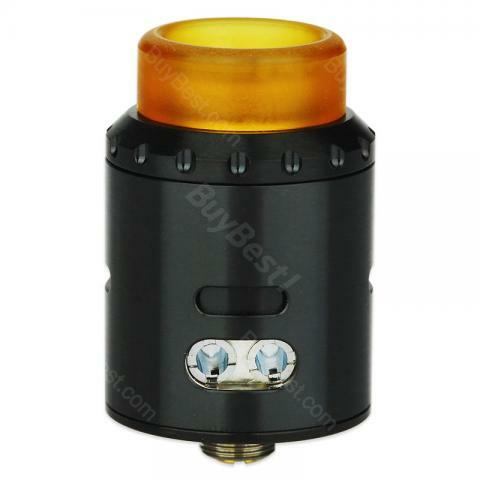 The Blitz Musketeer RDA is an easily-operated RDA and it comes with 24mm diameter. It features an bottom airflow system, side airflow system and fully open system. The special airflow control system enables it to provide flexible airflow. Also, it has a LP Goon style ULTEM drip tip and PEEK insulator, all of these features make you to enjoy a safe and pure vaping experience! 2 colors. Would give 5 stars but the procore aries tank that you get with the kit is a very leaky tank. The cuboid tap itself works great. First time to use Blith brand products. This Blitz Musketeer RDA Tank is not bad to me, and I like its design and flaovr. Zwar ohne Erfolg aber das liegt weniger an Blitz Musketeer. Die Watt-Zahl kann man gut variieren und man spürt auch einen deutlichen unterschied. Akku-Laufzeit ist auch in Ordnung.